According to reports BBC News, Papiss Cisse and Newcastle have reached an agreement that means the striker will wear the club’s Wonga logo on his shirt despite his religious beliefs. Cisse, a muslims, pulled out of Newcastle’s pre-season tour after telling the club he was not prepared to promote the money-lending company. 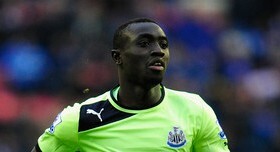 However, after a week of talks, both sides are satisfied and Cisse is now available to play for Newcastle again. The 28-year-old will return to training with the first-team squad on Friday.